Carrots are packed full of a variety of vitamins and minerals that improve overall health throughout the body. Carrots act as effective antioxidents because of their high beta-carotene content. More antioxidant properties exist in carrots due to the high potency of nutrients such as vitamins A, C, K, and B8, as well as biotin, folate, pantothenic acid, potassium, iron, copper, and manganese. Carrots are also high in fiber, which aids in the digestive tract. In addition carrots are known to be a heart-healthy snack because they lower cholesterol and aid in the prevention of heart attacks, strokes and diabetes. The potassium in carrots also contributes to more efficient blood circulation and the relaxation of the arteries and vesicles. Eye health by improving vision and preventing macular degeneration are associated with carrots due to their high vitamin A content. Skin, immune, and oral health are also improved by carrots. 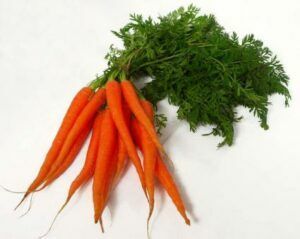 Carrots can also help to detoxify the body. The high fiber content could temporarily disrupt bowl movements resulting in loose stools. Also the high carotene could temporarily cause yellowish discoloration of the skin, most apparent in the soles of feet, palms, and ears. However, this condition, called carotenemia, disappears once the carotene consumption is lowered. Otherwise there are no serious side effects associated with eating too many carrots.